Bundesliga | The battle for survival: who needs what to stay in the Bundesliga? 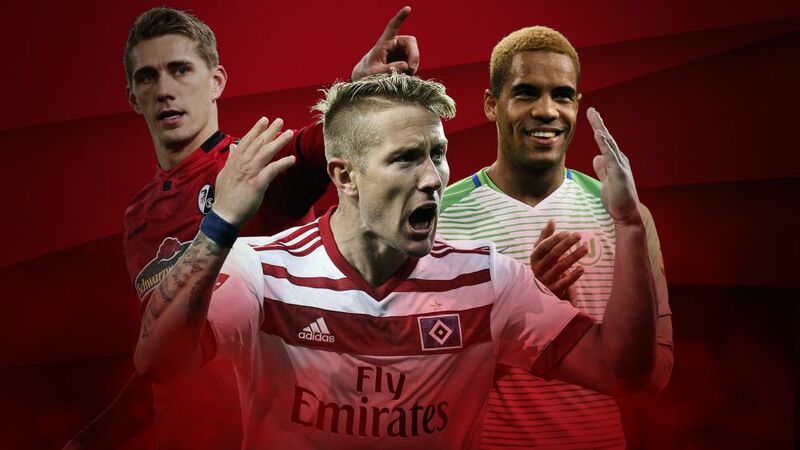 The battle for survival: who needs what to stay in the Bundesliga? The battle to join champions Bayern Munich and Schalke in Europe next season may be keeping many teams occupied heading into the final game of the current campaign, but there is still plenty of suspense at the other end of the table. Hannover and Mainz officially beat the drop on Matchday 33 - the latter thanks to a stunning win at Borussia Dortmund - but three teams below them still have work to do to ensure they do not suffer the painful fall into Bundesliga 2 alongside Cologne. bundesliga.com assesses the state of affairs in the basement as Freiburg, Wolfsburg and Hamburg. Last season’s sensational seventh-placed finish must feel like a distant memory for Freiburg, who find themselves firmly in an all-out war for survival. The Black Forest outfit had the chance to snap a four-match losing run and put some distance between themselves and the drop when they faced Hamburg on Matchday 31, but the 1-0 loss in northern Germany left them teetering on the edge. Winning their six-pointer at home against Cologne gave them some breathing room, but defeat at Borussia Mönchengladbach means they could still end up in the relegation play-off place. Their final game is against Augsburg, a side they haven’t lost to in their last four league meetings and who are already safe. With 15 Bundesliga goals to his name, the Freiburg frontman has only been outscored by Bayern Munich's Robert Lewandowski (29) this season. Petersen has been indispensable for the Black Forest side, finding the back of the net in five of their seven wins and contributing more than half of their 29 league goals. The 29-year-old was on target in the reverse fixtures against Cologne, Gladbach and Augsburg, and would stand a good chance of finishing as the Bundesliga’s top-scoring German if he finds his shooting boots on the final day. Following heavy defeats against Gladbach, Hamburg and RB Leipzig, Wolfsburg will host already relegated Cologne on the last day of the season. The Wolves will need a big win in that game to give them any chance of avoiding a repeat of last season - when they were required to see off local rivals Eintracht Braunschweig in the relegation play-off. Failing that, they could definitely do with at least a point to be sure of staying ahead of Hamburg, who currently occupy the second automatic relegation place. Prior to the loss at Gladbach, Bruno Labbadia’s side had been unbeaten in three, and claimed a vital win over fellow strugglers Freiburg on Matchday 29. However, a resounding defeat against direct rivals Hamburg meant that the Wolves would remain in the relegation scrap until the very end. Watch: Daniel Didavi scored a crucial brace against Freiburg on Matchday 29! The 28-year-old attacking midfielder has been a vital cog in the Wolfsburg machine this season, scoring nine goals and providing five assists. It was his brace that helped the Wolves get the better of Freiburg, while they were defeated 3-1 in the only three Bundesliga games he has missed. The former Stuttgart man got a consolation goal against Leipzig on Matchday 33 and was also on target as his side eased to a 3-0 win over Gladbach in December, in what could prove a crucial three points for a team with so few victories this season. Hamburg fans are under no illusions: it will require nothing short of a miracle to prevent HSV from suffering their first ever Bundesliga relegation in 2017/18. To extend a top-flight run that stretches all the way back to 1963, the three-time Bundesliga champions have to close a two-point gap on Wolfsburg. Their cause was aided on Matchday 32 with a win against the Wolves, but their fate is not solely in their own hands as a result of their 3-0 loss at Eintracht Frankfurt on Matchday 33. Hamburg have pulled off some great escapes in the past, but this one would make recently promoted coach Christian Titz an instant club legend. Nothing less than a win against Gladbach on the final day, however, will give his side any chance of returning for a 56th consecutive Bundesliga campaign. Having started the season as an integral part of the Hamburg squad before injuries and a change of management saw him lose his place, Holtby is back and proving how crucial he is to making this Hamburg team tick. The half-English, half-German midfielder has scored four goals in his last six games, and those strikes helped earn Hamburg ten priceless points which have kept them alive. The 27-year-old also has experience of keeping the Dino’s from going extinct in the Bundesliga, playing 29 and 34 games in the last two seasons respectively, as well as playing in both play-off games against Karlsruhe in 2014/15. On Matchday 32, it was finally game over for Cologne. A heavy defeat against Freiburg forced the Billy Goats to put their calculators away, as not even six points in their fixtures against Bayern Munich and Wolfsburg could lead them out of the drop zone. After four straight campaigns in the top flight, Cologne will play in the Bundesliga 2 next season after a disastrous unravelling. Last May, they were celebrating a remarkable fifth-place finish that saw them return to Europe for the first time in 25 years — but a miserable campaign that featured just five wins from 32 doomed their hopes of remaining in the German elite. Their part in this relegation battle is far from over, however, as they travel to Wolfsburg on the final day with the result there decisive in how the bottom of the table looks come the end of the season. One man who could be heading to the World Cup this summer, with a season in the second division to look forward to, is Jonas Hector. Injury prevented Joachim Löw's current first-choice left full-back from featuring for much of the first half of the season, and the Billy Goats struggled to just six points in his 14-game absence. Once he returned, they added 12 points to their tally in just eight games, underlining the importance of their on-field leader, who turned down the opportunity to join Barcelona last summer. It may have been too little too late for Cologne, but evidence, if ever it were needed, that Löw and Barca have both backed the right horse.